Acclaimed songwriter Lizzy Hoyt is one of Canada’s most powerful Celtic-folk artists. Known for bringing Canadian history to life, her songs “Vimy Ridge”, “White Feather”, and “New Lady on the Prairie” have garnered multiple awards and nominations while also connecting strongly with audiences across the country. In 2013, Lizzy was awarded the Queen’s Diamond Jubilee Medal by the Governor General of Canada for her outstanding contribution to commemorating Canadian veterans and history through music. Lizzy is a full-time musician who was based in Edmonton until a recent move took her to Winnipeg. She is returning to Alberta for a tour at the end of November and will be performing at Horizon Stage on Monday, November 27. Lizzy travels and tours throughout Canada with her trio. She has performed at renowned folk festivals (Edmonton Folk Festival, Montreal Folk Festival, Goderich Celtic Roots Festivals), folk clubs (Calgary Folk Club, Nickelodeon Folk Club, Northern Lights Folk Club) and through performing arts networks across the country. She has released four independent albums and two music videos. A talented multi-instrumentalist, Lizzy toured for ten years as a side musician before pursuing her own projects. She has been praised for her mastery of the fiddle, guitar and harp and her voice has been described as “otherworldly”, “angelic", “sweet”, and “pure”. As a singer she has also been recognized for her clarity and precision. Lizzy’s Queen’s Diamond Jubilee Medal may be the icing on her cake to date but her music and projects have received other impressive awards and nominations. 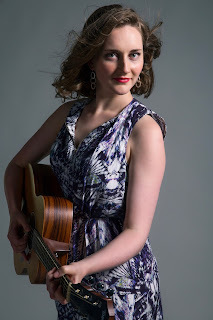 These include an International Acoustic Music Award (Best Female Artist), a Canadian Folk Music Award nomination (Traditional Singer of the Year), and finalist standing in two international songwriting competitions (John Lennon Songwriting Contest, USA Songwriting Competition). Lizzy’s “Vimy Ridge” video received twelve awards at eight international film festivals in North America. Enjoy a night filled with soaring melodies and fantastic fiddling by Lizzy Hoyt at Horizon Stage on Monday, November 27. Tickets are $35 for Adults and $30 for Students and Seniors and may be purchased at the City Hall Ticket Centre (315 Jespersen Ave), by phone at 780-962-8995 or 1-888-655-9090, and online through Ticketpro.ca. and her songwriting seems to flow from her soul."